Most antivirus engines that flag it use a generic flag for the application which is usually an indicator that it is a false positive. Still, you may want to run the program in a virtual machine or sandbox, or ignore it for the time being until it is resolved. You can run the program right after download, it does not need to be installed. The interface is simple: pick a Windows 10 build that you want to download and create an ISO from, and select the desired language, edition, and local save location. Check the "save UUPs to "UUPs" directory" and "Skip UUP to ISO conversion" boxes if you just want to download the UUP and don't need the ISO image. UUP is Microsoft's Unified Update Platform which the company introduced in 2016. The application supports stable builds but also Insider Builds and Windows Next builds. A click on "start process" begins the download of the selected build. Note that you may receive a "build is no longer available" notification if the selected build can't be downloaded anymore or if the connection is blocked by a firewall. 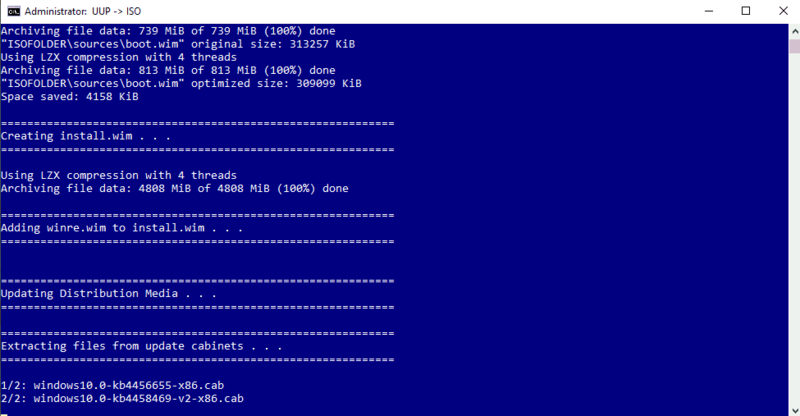 UUP Dump Downloader opens a command prompt window which lists each step of the process. The application downloads the files from Microsoft. The download may take a while to complete and you may monitor the progress as everything is echoed by the command prompt window. The application may integrate updates released after the build was released as well; happens if you select release updates and not Insider Builds. 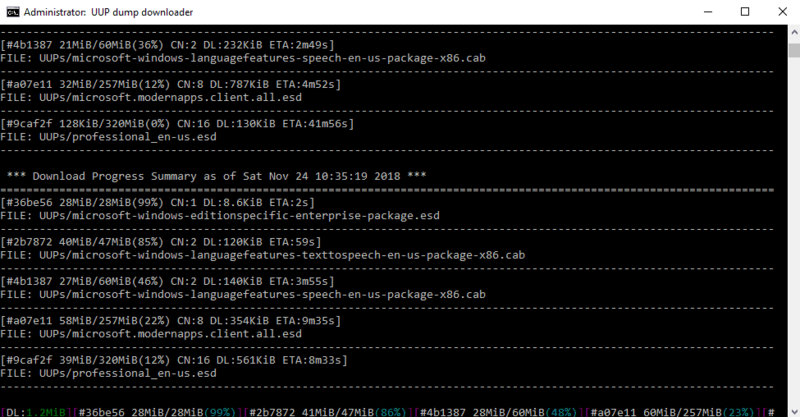 UUP Dump Downloader uses the Deployment Image Servicing and Management tool (DISM) to process the downloaded files. 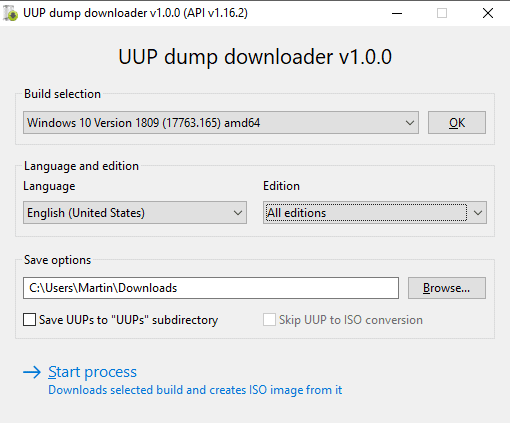 UUP Dump Downloader is an easy to use program to create up-to-date Windows 10 ISO images that include feature updates and integrate updates released afterward. The application has a few downsides at the time of writing. The flagging by antivirus engines is probably the major one as it will prevent wider distribution as users may not want to run the program or add an exception for it to run it. UUP Dump Downloader could have a better selection menu; an option to hide Insider Builds would be useful to make it more accessible. It would also be handy if the user could decide whether updates should be integrated or not. They can be sat while waiting for me to download any ISO of W10. A lot of versions from which to choose, 763.165 being the latest; Adguard site shows a much earlier update, 763.1; Windows ISO Downloader only provides a generic October-November update. My guess is Windows Media Creation Tool provides? Who knows? Great ISO’s for using on a Virtual Machine to check on the latest, I guess. They don’t have VL versions anymore. Does any of these tools provide the option to download a combined x86/x64 image? I only know of Microsoft’s Media Creation tool. I am guessing though it’s not a direct download, but it creates the combined image *after* downloading all required files. When I try to update OS to newer vers after downloading 1809.17763.165 through this App. ( I have 1809.17763.134 installed ) it refuses to update because i’ m trying to install vers. 1809.17763.1 and vers. i have is newer then I’m trying to install. Why it doesn’t change the Windows vers. to 1809.17763.165, or why windows installer read this vers. as 1809.17763.1? I finally guessed that the installation was stuck due to something it was getting from the internet, so I disconnected the Ethernet cord and then the setup ran fine. Somehow “dump” seems such an appropriate name for a Windows 10 downloader. Just an average user who wants less telemetry and more control over his OS – Should I go back to 1607? It’s a horrible time for computer users now with the Microsoft forced telemetry nightmare, unable to disable and set to full by default shows how much they care about people’s privacy. Seems cool. I’d use it.